It's incredibly easy to find a game or D&D event. From games at local stores to conventions hosting thousands of players, you can find the space that's right for you. If you’re a Dungeon Master or would like to try your hand at being the Dungeon Master, the D&D Adventurers League is a great way to run D&D games without having to spend a lot of time creating your own campaign world or adventures. As a Dungeon Master, you have the opportunity to weave a fantastic shared story for your players, as well as take the spotlight as the monsters and villains presented in D&D Adventurers League adventure content. You are also responsible for adjudicating the rules, and providing your players with their characters’ experience points and rewards at the end of each session. If you plan on running a game in private, all you need to do is purchase the adventure you want to run, prepare the adventure, find some players, and have a good time. Possible adventures include the Lost Mine of Phandelver from the D&D Starter Set; any of our hardcover adventure releases, such as Curse of Strahd or Storm King’s Thunder; or any of the adventures designated as D&D Adventurers League content on the Dungeon Masters Guild online. The Lost Mine of Phandelver is recommended for new D&D players and Dungeon Masters. It’s a great way to introduce folks to D&D, and you can find it in the D&D Starter Set. Playing through the whole adventure can take characters up to 5th level. You can play this at home or as part of an in-store play event. It takes several play sessions to complete the adventure. Tracking your play for this adventure on a D&D Adventurers League logsheet makes it official—you get to keep all your rewards no matter where you go next! If you plan on running a game at a store or public event, contact the organizer using our Store and Event Locator to help find one near you, or see the information below regarding organizing an event. Ask the organizer if you’re responsible for purchasing the adventure online, or if they’re planning on doing so for you. Once purchased from the Dungeon Masters Guild, you can download the adventure, and even print it out if you like. Prepare your adventure. Make sure you read through the adventure and make notes where appropriate. D&D Adventurers League adventures are easy to prepare and run. Run a fun game! As the Dungeon Master, you help guide the players through the adventure, and facilitate the story coming alive. Make sure you follow the golden rule: Make decisions and adjudications during the game that enhance the fun when possible. If you’re new to the role of Dungeon Master, you only need a few things to get started. A Player’s Handbook or the D&D Basic Rules. The D&D Adventurers League Players Guide and Dungeon Master's Guide. An official D&D Adventurers League adventure. A set of dice, pens/pencils, and paper. Players kind of have it easy. All you need to do is, find an event, make a character, and show up and play. If you don’t already have a group to play with and would like to find a public event, go to our Store and Event Locator online. Make sure you call ahead to confirm times and to see if they have room for new players. Character creation is easy. You’ll need either a Player’s Handbook or a copy of the D&D Basic Rules, and a D&D Adventurers League character logsheet. Check out the D&D Adventurers League Players Guide for more information. Find a place to play. Game stores are typically the best places to organize D&D Adventurers League games, but you can organize an event at other locations such as a school, library, or community center. Find Dungeon Masters. Recruit from among your friends, interested players in your store, or use social media and other online community groups to get Dungeon Masters for your event. Advertise your event. Post flyers in nearby stores, schools, and community centers. Create online events and allow players to register for games. Use social media to promote your event too! Prepare event materials. You’ll need things like blank character sheets, adventure logsheets, pre-generated characters, event registration lists, and copies of the adventures you’re featuring at the event. 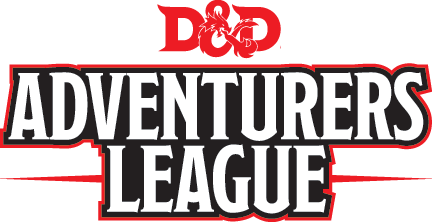 Adventures meant for D&D Adventurers League play can be purchased online at the Dungeon Masters Guild. Run your event and show your attendees a good time! Make sure to be responsive to feedback and address any issues that come up as soon as possible. Private play including home play and online play. Published adventures themed around the current D&D storyline are considered official for D&D Adventurers League, so you can use those or adventures available through the Dungeon Masters Guild. Game stores are supported through the Wizards Play Network. Conventions describe in-person public play events. This can include actual gaming conventions, as well as a one-off public gatherings or game days. Online includes play on various online platforms, such as Fantasy Grounds and Roll20. We have a great team of campaign administrators available to help answer your questions and set you on the path to a successful event! You can find out more by heading to dndadventurersleague.org—our organizer support page! Find a location to buy or play Dungeons & Dragons near you! A new way to buy and share D&D adventures set in the Forgotten Realms. Access and manage many of your existing accounts with Wizards of the Coast, including your DCI and customer support.